Avocado Tomato Corn Salad came about one day when I went into the kitchen to make myself a light lunch and the only ingredients I had were the ingredients that make up this salad. I have to admit, this salad turned out super delicious. In fact, I’ve eaten it for lunch every day for the past four days…it’s that good! 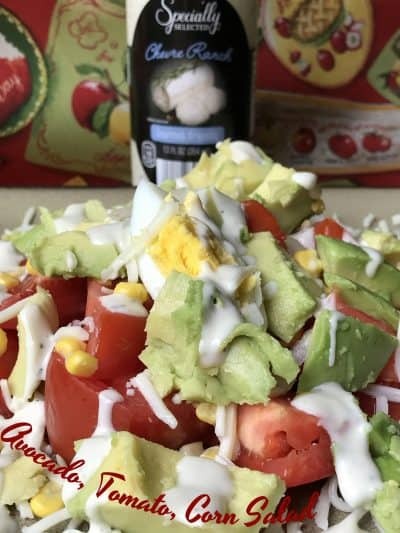 This salad is topped with a fantastic salad dressing that I found at Aldi called Specially Selected Chevre Ranch Gourmet Dressing. 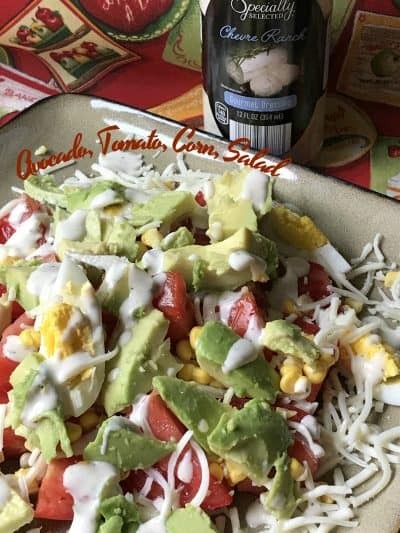 This salad is made with garden fresh tomatoes, fresh sweet corn-off-the-cob, sweet onion, and avocados. I topped this salad with shredded mozzarella cheese but you could certainly use goat cheese, shredded Swiss cheese or any cheese you like. You can even pass on the cheese if you prefer. Not a lover of ranch dressing?? Toss this salad with a fresh lime juice, honey, and chopped fresh cilantro to add super fresh flavor to this salad. A word about this fantastic salad dressing I found at Aldi, Specially Selected Chevre Ranch. This delicious salad dressing is super tangy, with just the right amount of “ranch” flavor. I’m not a huge fan of ranch dressing, but Chevre Ranch dressing is super good. It would be great as a dipping sauce for so many “dip-worthy” finger foods. Don’t let the word “chevre” worry you. Chevre simple means goat cheese. If you have never tried goat cheese, you need too:) It’s a mildly, tangy cheese. One bite of this fresh & unique salad and you will fall in love. The fresher the ingredients used in this recipe, the better. Take advantage of farm stands and farm markets to purchase fresh veggies. 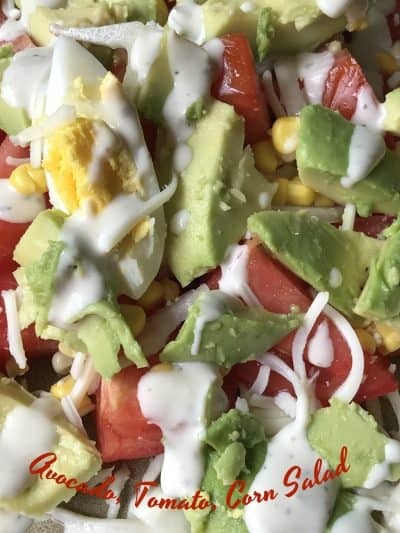 I haven’t made this salad with frozen corn or store-bought tomatoes but if you do, please let me know in the comments section below how it turned out! Have a great week-end! Cool Cucumber Radish Salad is a cool, crisp salad you might want to try especially when cucumbers and radishes are plentiful in the garden. Fresh Avocados, Tomatoes and Corn go together beautifully in this simple yet delicious salad. Combine all ingredients, except ranch dressing in a large bowl. Toss gently to combine. Divide salad between 4 salad plates and serve with dressing on the side. Are you still hungry for more? Great! Give these recipes a try. Sun Dried Tomato Dip, White Christmas Lasagna and Pizza Quesadillas.